Teeth that are exposed to coffee, which is an acidic hot liquid, tend to stain and become discolored gradually over time. Your teeth have a delicate layer of white enamel that is prone to staining. The dental industry has created various tooth whitening systems that help keep your teeth white. However, you still want to do your part to prevent coffee stains from forming on your teeth. Here are 10 ways to get rid of coffee stains from your teeth. Cow milk is high in protein and is capable of binding to the polyphenols in coffee. Instead of attaching to your teeth, the polyphenols are swiftly broken down in the stomach. Almond, soy and other types of milk do not contain polyphenols, it can only be found in animal milk. Caffeine is one of the main reasons people drink coffee, especially in the morning. The caffeine level determines the severity of the staining effect on your teeth. 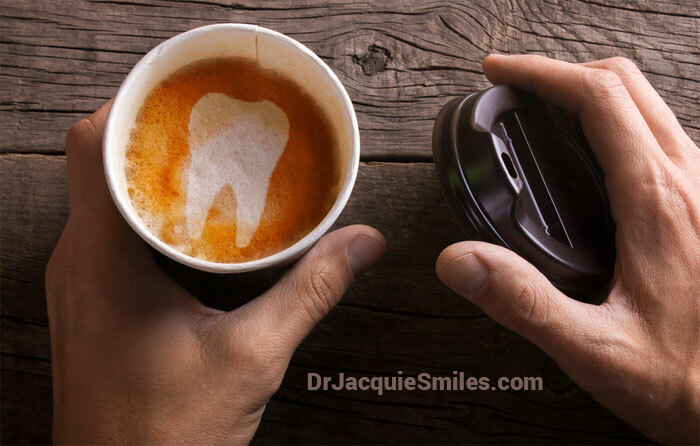 Decaf coffee compared to caffeinate coffee is less likely to stain your teeth. After you finish your morning cup of coffee, brush your teeth to prevent stains from settling into your enamel. If you drink coffee at work or anytime throughout the day, bring along a toothbrush and toothpaste so you can keep up the routine when needed. Do you want whiter teeth in about an hour? The Zoom! In-Office Whitening System uses proprietary technology to treat all teeth simultaneously, remove stains from veneers, crowns, and other dental restorations and provide long-lasting results. This system has the power to whiten teeth an average of eight shades. Dr. Smiles White System is an innovative alternative to teeth whitening was developed by Dr. Jacquie Smiles using cutting edge technology. The in-office treatments provide patients with whiter teeth quickly and without sensitivity. If you don’t have a toothbrush and paste close by, gargle with water. The water prevents the pigments from the coffee from permanently lodging onto your teeth. Consuming water and gargling lessens the chance of them staining. Raw crunchy vegetables such as broccoli and carrots contain tiny fibers that act as cleaners against tooth enamel. As you chew it naturally removes stains caused by coffee pigments. In addition, the vegetables help initiate the production of more saliva which helps increase the rate the stain-causing pigments trapped in the crevices of teeth are broken down. Regular professional whitening services are recommended, but when you are in between sessions, you can help keep your teeth white with a high-quality dentist recommended whitening toothpaste. Drinking coffee with a straw might not be a popular choice, but it will prevent the coffee from touching most of your teeth. This lessens the risk of coffee stains and damage due to exposure to acidic liquids. Flossing should already be part of your daily routine. Knowing you can prevent your teeth from being stained should encourage you to floss more often. Getting rid of coffee stains can be done with the tips listed above. Remember, coffee stains teeth but the acid it contains also damages tooth enamel. Always consult with a professional before trying any tooth whitening system.